Kitchen islands can be a great addition to your kitchen design. Here is a round up of some of the benefits of incorporating an island unit into your kitchen and some tips and ideas that you might want to consider. An island can be a fantastic way of maximising empty space in a square kitchen. By bringing workable areas closer together you can also create a more efficient ‘golden triangle’, ie bringing preparation areas, cooking facilities, sink and fridge within close proximity. It can also be really good for kitchen spaces that don’t have a lot of wall space such as those with large windows, patio doors or bi-folding doors. Have you ever noticed that an island unit is often a magnet for people to gather around at parties? An island is usually higher than a table so people can stand there, or sit on a high stool, and still have somewhere for their food or drinks and it’s much less formal than sitting at a table or on a sofa. They can also still talk to whoever is busy cooking or preparing drinks. It’s also a good area for children, where they can sit and do homework or just chat while a parent prepares a meal. An island unit can function as a ‘halfway house’ in an open plan living space. As described above, it can be a social area where someone can sit and chat to whoever is cooking or it can also work the other way; providing a distinction between kitchen and living space – it just depends on how you design it and what elements you incorporate. An island unit can really add a lot of extra practicality to the kitchen. It can include extra storage, appliances such as hobs, ovens, dish washers, under counter fridges, boiling water taps and sinks. It can also offer extra food preparation space and seating. Just think about how you want it to work with the rest of the kitchen but don’t try to cram too much into it. Make sure you allow enough room around the island. There’s no point including an island if it makes the space impractical. Allow at least 3’ between an island and the wall and 3.5’ between the island and the kitchen units. If you incorporate appliances, make sure doors can be fully opened easily into the space. There should be room for a couple of people to move around easily within the kitchen area. If there isn’t, an island may not be appropriate. Consider different materials or colours for the island to the main kitchen. This can be a great way of adding contrast to the kitchen and because the island is a smaller area than the rest of the kitchen you may be able to splash out a little more on more expensive materials such as granite worktops. The more elements you add to an island, the more expensive it’s going to get. A basic storage unit with seating is the cheapest option as appliances and sinks require extra elements such as electric, gas and/or plumbing services. An island without added services can even be set up as a movable unit that can be pushed elsewhere if desired, eg for parties or for moving furniture in and out of the house. Consider split levels in your island. Lower levels can be used for food prep and higher ones for seating. This way both functions stay distinct (and it saves people’s elbows from the potato peelings!). Islands can be different size and shape configurations, depending on your space. For example, a longer kitchen could have a long slim island and a square kitchen can have a fat square or even circle shaped unit. They can also be set at an angle to the kitchen; they don’t always have to run parallel. Your kitchen designer can help you decide whether an island unit is suitable for your own space and what elements you could incorporate into it. If you are based in Yorkshire and would like to book a free design consultation with our kitchen designer, please call us on 0800 321 3491 or send us a message. 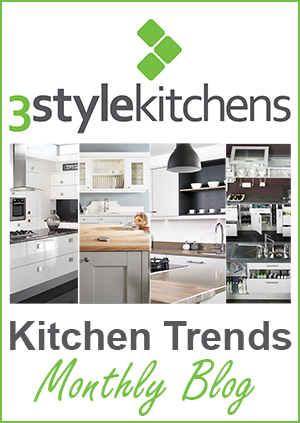 0 Responses to "Kitchen Trends Monthly Blog – April"